Remember having to learn the elements of the periodic table back in chemistry class? Visual Literacy now presents a ‘Periodic Table of Visualization Methods’ that has been published by two scientists from the University of Lugano in Switzerland. Each elements represents a visualization method, from ‘C’ like ‘continuum’ to ‘Sd’ like ‘spray diagram’. The Sankey diagram can be found as element ‘Sa’ in the periodic table. It is colored in green for being in the ‘Information Visualization’ category. Furthermore its characteristics are ‘Overview’ and ‘convergent thinking’. You can see the full periodic table at visual-literacy.org and hover the mouse over to see an example for each visualization method. The original article (Lengler R., Eppler M. (2007). 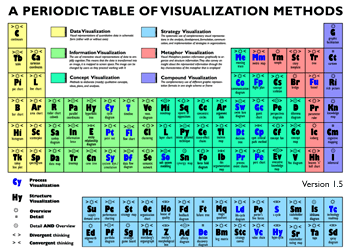 Towards A Periodic Table of Visualization Methods for Management. In: IASTED Proceedings of the Conference on Graphics and Visualization in Engineering 2007, Clearwater, FL, USA) and the table separately are available as PDF files.